It’s June, which in Tucson means it’s hot and dry. Our monsoon won’t kick in until about the first week in July, so for now the native prickly pear cactus are looking flat and dehydrated. Add to this heat and super low humidity the winds we have in April, May and June and the ever-present human carelessness and fires are inevitable. To the southeast we have over 825 personnel fighting the Horseshoe Two Fire which started May 8 and has devastated over 86,000 acres of Cochise County near the Chiricahua Mountains and to the northeast 140,000 acres have burned so far in the Wallow Fire, which is raging through Apache and Greenlee Counties in the White Mountains – putting homes and rental cabins in the towns of Alpine and Greer in danger. The Horseshoe Two fire is still only 50 percent contained after almost a month of burn. They estimate another two and a half weeks before containment. Hopefully we will be blessed with some early rains in Arizona – not only for the beauty of the desert plants, but to aid the firefighters in their grueling jobs. Image copyrighted. Use requires proper licensing from Martha Lochert. 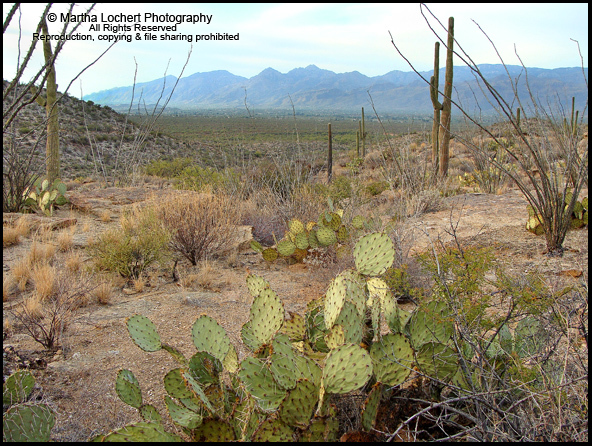 This entry was posted in color photography, landscapes and tagged cactus, Catalina Mountains, landscape photography, prickly pear, Saguaro National Park, Sonora Desert, Tucson. Bookmark the permalink.